When I first created my web design freelance company, I was mainly designing websites for family and friends. I didn't take a whole lot of thought into coming up with a professional name, since I expected the company to remain fairly informal. 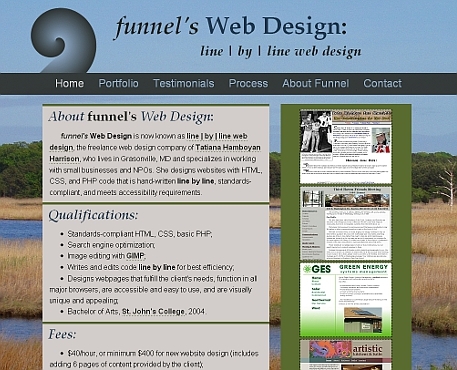 Funnel was one of my nicknames in high school, so I just named the company "funnel's Web Design". When I created this website design, I wanted to emphasize my respect for the area in which I live, which is why I chose that background image (and why I still continue to use it on this site). The design served me well for over a year, but the very thin left-hand column made the Portfolio page a problem. The design just wasn't flexible enough to support an ever-growing Portfolio page and no longer reflected the best design I could come up with. In late August, 2010, I finally came up with a new design that I was satisfied with, which became this website. I also made the decision to re-name my company to better reflect what makes me stand out from other website designers. Thus, I came up with the new name "line | by | line web design".